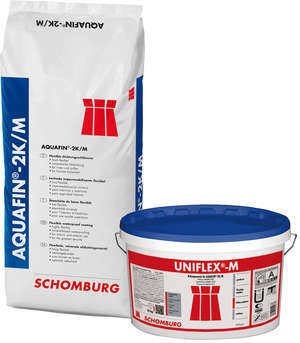 AQUAFIN®-2K/M is a state of the art, highly flexible, protective and waterproof coating, ideal for sealing and coating a wide variety of projects. AQUAFIN®-2K/M was developed due to a demand for a truly flexible coating, not only in terms of physical properties, but also in terms of applications and application methods. It is a two-component product resistant to water, moisture and abrasion, and composed of a cementitious powder and solvent free liquid. It has superior adhesion to many substrates, including concrete, brick, masonry and somenatural stone substrates. AQUAFIN®-2K/M is a leader in its class with up to 115% elongation, making it the perfect solution for waterproofing substrates prone to movement and cracking.